Have a discussion on expected behavior prior to the trip, as well as a little refresher before boarding. Pack plenty of books, stickers, paper, crayons, magazines, and anything else that can be read, or incorporated into an easy mess-free craft project. Remember, obviously, no scissors. Three words: Portable. DVD. Player. Fly a kid-friendly airline like [[Frontier Airlines | Frontier]], [[JetBlue Airways | JetBlue]], or [[Virgin America | Virgin America]] with seat-back televisions. There’s almost always a channel with children’s programming. 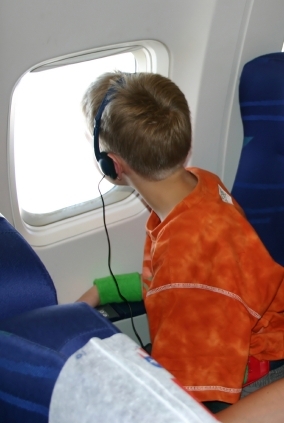 Request a window seat so your child can look out and lean at will without disturbing other passengers. Never do early boarding. The less time on board, the better. Sitting around, twiddling thumbs (or using up all your games and activities before you even take off) while you wait for the plane to fill up will probably take longer than you think. For the slightly older kids, who may potentially taunt one another: Pay them off! $5 an hour, $1, a quarter, whatever you think sounds about right. Personally, my mother would clutch her pearls at the suggestion that she pay her children to behave, but hey, I’m certainly not above it. We used this trick when going to Disneyworld, and they only lost one hour’s worth of bribes. Let them stay up a little later the night before the flight, or wake up very early the day of. Once onboard, bring blankets and pillows and let them catch up on sleep. See other children acting up on your flight? Remember to thank your own for not doing that, and for setting a good example. To read more parent tips, go to the Airfarewatchdog blog and also read SmarterTravel’s readers’ recommendations for traveling with kids. Have any good tips of your own? Post them below.